eM Client 7 has been submitted to first groups of testers, yet we still have a lot to share about the new release before launching. Here's some more information about the upcoming features of the new version. eM Client is going to get a bit more darker with the new release. We'll implement new appearance options including some of the already available themes and some new ones, most importantly a dark theme for late nights spent on your computer. This is a small but very wanted addition to the application. 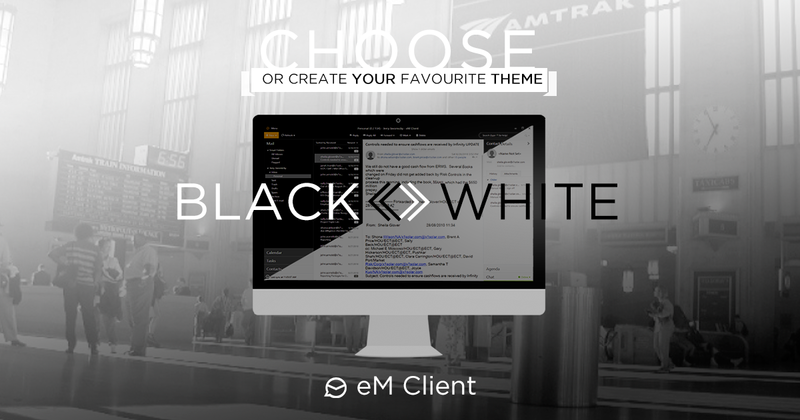 Some of our users have already created dark themes for the current release but there was always a catch with the design, thus we'll be including an original eM Client theme for all our all-nighters. Theme options are available in the application settings under the Menu > Tools > Settings > Appearance. Choose your favorite theme or create a custom theme that suits your needs using simple XML templates. Follow us on Facebook or Twitter to find the latest information about the upcoming features of eM Client 7 and more.